In October of 2007, Olivia Stinson from North Carolina started a group called “Pen pals Book Club and Support Group for Children of Incarcerated Parents”. The idea came after Olivia’s church sponsored a Christmas dinner and gifts for teens (ages 12 through 19), who were actually children of incarcerated parents. The event was beautiful, but the problem was, they didn’t see those teens again until next Christmas. That’s when Olivia knew there was something to be done. This great initiative has helped teens in many ways. The book club, to begin with, promotes literacy, creativity and the teens learn about history and different cultures. Having a pen-pal, on the other hand, has also helped them with literacy, orthography, creative writing and it’s just been a great help for them to have a friend they can write to and build relationships with people. Usually the children of incarcerated parents spend their time at grandparents’ houses, or with some other family member if these exist, otherwise, they just go to foster homes and many escape to the streets. It is incredibly important that these teens know they’re not alone, and that they are part of something greater, that helps them develop themselves in a safe environment. By being part of this group, the teens are also exposed to social and sporting activities, and they give back by volunteering in their communities every month. In 2012, the Pen-pals Book Club and Support Group made it to its 5th anniversary! They celebrated at their church and the community participated by sharing how their lives (the homeless, the at-risk, the hungry, the forgotten and the less fortunate) had been touched in one way or another by a pen-pal. We hope this article made you smile and made you want to do something great today! It makes us happy to know that people are using letters, and pen-pals for something as good as this. 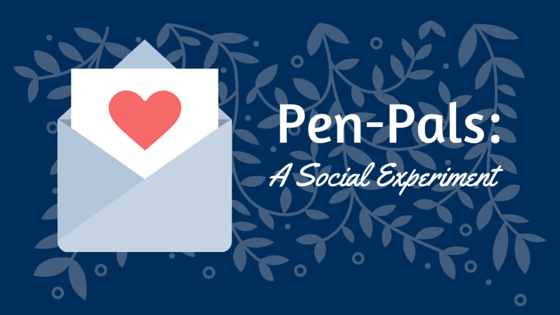 Can you think of ways in which you can use pen-pals or writing letters for a social good? Feel free to leave your comments below!